Intimidation Clothing is pleased to announce its continued sponsorship of veteran fighter “Big” John Hawk, as he prepares to face rising MMA star Curt Lemmon (4-0) in a heavyweight title bout at the upcoming NAAFS: Caged Vengeance 16 event on March 7th Canton, Ohio. Hawk (10-5) continues his run in his return to heavyweight, as his victory over William Penn in March 2014 was the first fight for the former NAAFS heavyweight champ in the division since 2010. He then followed up that win with a victory over Bobby Brents at NAAFS: Rock ‘N Rumble 8 last October. Hawk has become known as one of the most durable fighters in the sport, including racking up a 2-1 win under the Bellator MMA banner with an upset win over Marcus Vanttinen at Bellator 66 highlighting his time in the organization. Hawk will look to become the NAAFS heavyweight champion for the second time, as he won the title with a victory over Joe McCall in 2010 before dropping to light heavyweight. The title was then won by and later vacated by Intimidation alum Stipe Miocic when he signed with the UFC in 2011. Hawk is a fan favorite in Northeast Ohio and comes in looking for his fifth win in seven outings. Known for his willingness to fight anybody at any time, Hawk is an outspoken member of the Strong Style Fight Team in Northeast Ohio, which is an official Intimidation Clothing dealer. Hawk has not one but two signature t-shirts from Intimidation, including the original gray and an updated red signature shirt that was released in June. It was one of the most popular items at the Intimidation booth at the Fight Nite in the Flats 10 event in Cleveland last June, and Hawk wasn’t even competing on the card. Intimidation Clothing is a fast-growing brand of MMA inspired lifestyle apparel with a growing national presence and over 50 authorized dealers across the USA. Known as the biggest supporter of local MMA, the Intimidation brand is also regularly featured on multiple sporting events on SpikeTV, AXS TV, SportsTime Ohio, MTV2, FUEL TV, The Comcast Network, Comcast SportsNet and EpixHD as well as MMA highlight shows on Spike TV, AXS TV and more. In addition to over 110 styles of high-quality, bold t-shirts and sweatshirts for men, women and children and is also known for their premium-quality EliteFighter MMA board shorts. Anyone interested in becoming a dealer can apply to sell the Intimidation brand as a dealer and they can be found for sale online at IntimidationClothing.com. Fans can also follow the marketing wing of the Intimidation brand, Intimidation Interactive Media, @IntimidationIM, like Intimidation Clothing on Facebook or follow @IntimidationMMA on Twitter. Intimidation Clothing is pleased to announce its continued sponsorship of rising star Cory Alexander in his upcoming bout on Febryar 27th in Highland Heights, Kentucky. Alexander (7-6) is set to take on another fast rising fighter in Cody Gabelman (2-0) in a featured pro bout at Absolute Action MMA 41 at the Bank of Kentucky Center in Northern Kentucky, just outside of Cincinnati. Alexander has burst onto the scene as one of the sport’s more exciting prospects, and his 6-2 record at 125 pounds has put given him national exposure. His only losses at his natural weight class are to Dustin Ortiz, who is now on the UFC’s roster, and Juan Puerta (8-4) in his most recent outing. A former state placer in wrestling during high school, Alexander took up MMA on a whim when his former wrestling coach turned down a fight that was eventually offered to him. He propelled that experience into a 10-1 amateur record, and he now comes into this fight with wins in 4 of his last 5 outings. The SSF Submission Academy product will compete as a member of Team Intimidation for the third time, as he sported the Intimidation brand for his victory over Lathral Perdue in June and his most recent bout against Puerta last September. 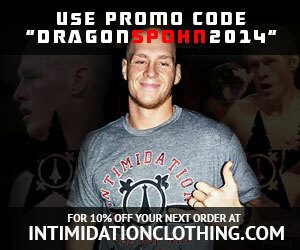 Intimidation Clothing is a fast-growing MMA inspired clothing brand with a growing national presence and over 50 authorized dealers across the USA. Known as the biggest supporter of local MMA, the Intimidation brand is also regularly featured on multiple sporting events on SpikeTV, AXS TV, SportsTime Ohio, MTV2, FUEL TV, The Comcast Network, Comcast SportsNet and EpixHD as well as MMA highlight shows on Spike TV, AXS TV and more. In addition to over 110 styles of high-quality, bold t-shirts and sweatshirts for men, women and children and is also known for their premium-quality EliteFighter MMA board shorts. Anyone interested in becoming a dealer can apply to sell the Intimidation brand as a dealer and they can be found for sale online at IntimidationClothing.com. Fans can also follow the marketing wing of the Intimidation brand, Intimidation Interactive Media, @IntimidationIM, like Intimidation Clothing on Facebook or follow @IntimidationMMA on Twitter.